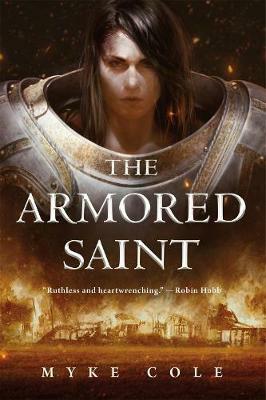 Myke Cole, author of the beloved military fantasy Shadow Ops series, debuts a new epic fantasy trilogy with The Armored Saint, a tale of religious tyrants, arcane war-machines, and underground resistance that will enthrall epic fantasy readers of all ages. After witnessing a horrendous slaughter, young Heloise opposes the Order, and risks bringing their wrath down on herself, her family, and her village. She must confront the true risk that wizards pose to the world, and weigh the safety of her people against justice. After a career in the military, police and intelligence services, MYKE COLE tracks fugitives as part of the investigative team on CBS' new hit show "Hunted." Myke's three tours in Iraq inspired his military fantasy Shadow Ops series. But the work hasn't separated Myke from his nerd roots. He's still a voracious fantasy reader who never misses his weekly game night. Myke's fandoms range from Star Wars to military history. He's a former Kendo champion and heavy weapons fighter in the Society for Creative Anachronism. At the D&D table, he always plays Paladins. Myke lives in Brooklyn, NY.